*Remember what Tuesday Sun crosswords were like? Sort of like Wednesday NYTs but with zingier clues? This summer, Peter Gordon ran into stand-up comic Lee Camp in a bookstore's puzzle section. Peter steered Lee towards one of his books, and in turn Lee gave Peter a disc featuring some of his stand-up. So Peter based a crossword, "Campy Humor," on one of Lee's jokes (that link is a JPEG of the puzzle). Enjoy! Exciting afternoon in Chicago! I went to my local indie bookstore, Unabridged Bookstore, and saw my book, How to Conquer the New York Times Crossword Puzzle, there for the first time. 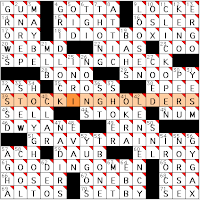 Their crossword selection is so teeny, I despaired of their ever stocking my book. So I signed the one copy they had and the guy smacked an "Autographed Copy" sticker on it. I took a picture of it with my phone but I'm too lazy to download the photo right now. • 27A, 52A. [Wild guess...or what the answer to each starred clue has?] is A SHOT IN / THE DARK. The DARK is the black square before or after the starred entries where the SHOT is hidden. • 5A. [Jigger] is a shot GLASS. • 17A. ["That's way off"] clues "NOT BY A LONG shot." • 38A. This is the first of three "shot in the dark" entries in a single row. 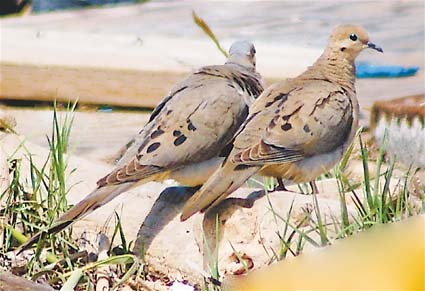 A [Photo] is a SNAPshot. • 39A. A JELL-O shot is a [Colorful party drink]. 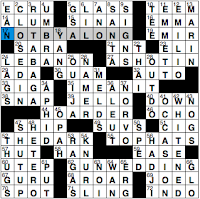 Is this the first time the seamy little Jell-o shot has been featured in the NYT crossword? • 40A. The same black square is called into action a second time. Shot DOWN means [Rejected]. • 62A. [Quick hitch-up] is a shotGUN WEDDING. • 71A. A SLINGshot is a [Y-shaped item]. • 10D. [What "fore" may precede], in golf, is your TEE shot. • 61D. The shot PUT is a [Track-and-field event]. Most of the theme answers would, with the inclusion of their "shot" part, make for lively crossword fill, and not a one of 'em is the slightest bit iffy. 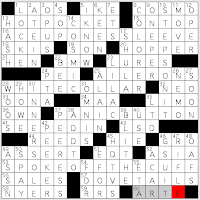 Despite the wildly out-there 37D (NORVO, or [Red of early jazz]), the puzzle wasn't too tough at all. 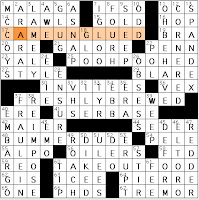 I would've had a Wednesday solving time if I'd bothered to read the clue for 23A when I filled in EMMITT instead of EMMETT for 11D: [Daniel Decatur ___, composer of "Dixie"]. I blame Emmitt Smith, of course. • GUAM was a [Stop on Magellan's circumnavigation of the world]. • [Cuisine with sen yai noodles] is THAI. I had the Rama chicken tonight myself. What are sen yai noodles? • [El numero de agosto] is OCHO, or eight. The other day, I caught part of a phone number on a Spanish-language radio commercial. "Uno ocho ocho ocho..."
• To SPOT is to [Give a handicap of]. Don't you think I should be SPOTted at least 50 points when I play Lexulous (the Scrabble variant on Facebook) against a lexicographer? I do. • OK, this one's a favorite answer and not a clue. RUTABAGA! It's a [Vegetable that's peeled]. The word's from the Swedish dialect rotabagge. I also like KNURL, a [Small ridge on the edge of a button or dial]. • [Nick name?] is SANTA, or St. Nick. • [Rat Island resident] sounds fictional, doesn't it? It's an ALEUT. 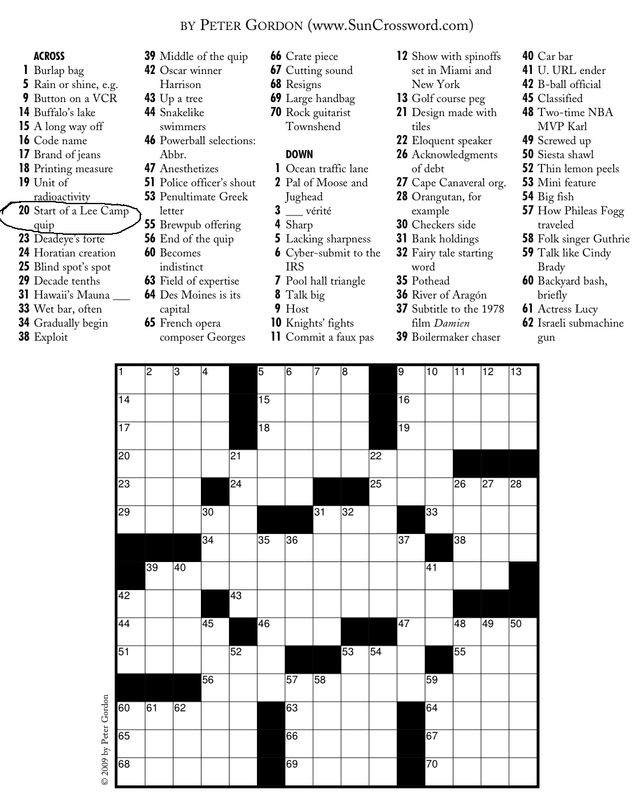 Ben Tausig's Ink Well/Chicago Reader crossword, "Action!" • 18A. [Sport for people apt to wear their gloves upside down?] is IDIOT BOXING, building on the idiom "idiot box," meaning television. • 24A. The computer spell-check morphs into Tori Spelling. SPELLING CHECK is a [Search for Tori on IMDB?]. • 39A. [Lingerie shopping assistants, at times?] might be STOCKING HOLDERS (stockholders). • 51A. [November cooking school program?] is GRAVY TRAINING, getting set for Thanksgiving gravy. The gravy train is "used to refer to a situation in which someone can make a lot of money for very little effort," per the New Oxford American Dictionary folks. You know what? I don't like gravy. • 61A. [Sign that Cuba is near? ]...well, on my cruise last winter, it was big waves rocking the ship. But Ben's answer is GOODING OMEN, combining a good omen with Cuba Gooding. I liked the inherent surprise in each theme entry, with the before and after versions having such different connotations. 1A is clued [Alternative to smoking]. You wanted NON, right? But instead, it's nicotine GUM, or any old GUM that satisfies the oral urge. At 20A, WEBMD is clued as a [Site that kept telling me I either had sunburn or cancer, when I had food poisoning]. I learned a little German when ACH was clued as 57A: ["Die Wurst ist ruiniert!"] ("the sausage is ruined"). How about 34D: [Power trio member? ]—were you thinking of Rush, the Police, or Cream? The answer is the HOLY GHOST. YUGOS are 52D: [Reviled cars that ceased production last year]. If you haven't seen Nick and Norah's Infinite Playlist, you should rent it—Michael Cera's enormously appealing character drives a yellow Yugo that is practically a character in the movie. •16A. ACE UP ONE'S SLEEVE [Secret advantage]. And one lively phrase, with its card-playin', Wild West conjurin' roots. •28A. WHITE COLLAR [Kind of crime]. Think "Bernie Madoff"... A blue collar worker is a skilled laborer, and here are some "other collars of the rainbow" (not my locution—dang). •53A. SPOKE OFF THE CUFF [Gave an extemporaneous speech]. Another very lively phrase. •57A. DOVETAILS [Meshes]. More like this, which is related to this. As the OED defines the term dovetail joint (and shifting to the noun form), it's "a fastening or joint composed of tenons cut in the shape of an expanded dove's tail, fitting into mortises of corresponding shape." • 17A. [Lost it] clues CAME UNGLUED. • 25A. POOH-POOHED means [Dismissed out of hand]. • 37A. [Like Starbucks coffee, every 30 minutes] is FRESHLY BREWED. Rumor has it the coffee will still taste burned no matter how fresh it is. • 48A. "BUMMER, DUDE" is clued with ["That's too bad, man"]. • 60A. TAKEOUT FOOD is an ["I don't feel like cooking" option]. With a half dozen 8-letter answers (plus a bunch of 6s and a couple 7s) in the fill, we don't have the same tired 4x4 chunks of grid. Highlights: the [Austin Powers catchphrase] "Oh, BEHAVE! "; SPANDEX, that [Stretchy fabric]; and FRÄULEIN, a [German miss]. Sound-wise, I also like IGLOO crossing UNGLUED.